Rangers-mad man about town Angus MacPhee is to make the ultimate sacrifice to raise money for the favourite cause of his recently departed friend Davy Sutherland. Wee Davy organised the Poppy Ceilidh on Colonsay for many years raising thousands of pounds for the Earl Haig Fund – and Angus is determined this year’s ceilidh will raise more than ever. 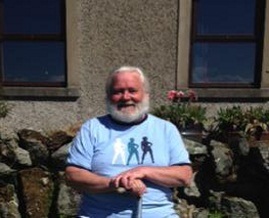 “I have pledged to spend the whole of ceilidh day in July wearing a Celtic top – and to add insult to injury I’m going to dye my beard green and then loose it and the flowing locks in the hall on the night – if enough cash is pledged to the fund – sponsor forms available in the shop.